Angola goes to the polls on Wednesday in a historic election marking the end of President Jose Eduardo dos Santos’ 38-year reign, with his party set to retain power despite the country’s economic crisis. The MPLA (People’s Movement for the Liberation of Angola), which has ruled the country since its 1975 independence from Portugal, is expected to defeat opposition parties that struggle under a repressive regime. Dos Santos’s retirement – reportedly prompted by ill health – has triggered the biggest political transition in decades for Angola, a leading oil-exporter in Africa. However, his chosen successor, Defence Minister Joao Lourenco, is a loyalist who is predicted to avoid immediate change in a government often criticised for corruption and failure to tackle dire poverty. “Dos Santos brought forward his departure to after these elections due to his deteriorating health,” Alex Vines, of the Chatham House think-tank, told AFP news agency. At a weekend rally in front of thousands of MPLA party supporters, dos Santos, a frail-looking 74-year-old, made a brief appearance to endorse the likely new president. “We have no doubt about the victory of the MPLA, and our candidate will be the future president, which is why I ask you: August 23, vote MPLA … and Joao Lourenco,” he said in a weak voice. Dos Santos has been dogged by reports of illness and his regular visits to Spain for “private” reasons fuelled criticism that his health status was being hidden from ordinary Angolans. Earlier this year, his daughter Isabel – who has become a billionaire and Africa’s richest businesswoman under his rule – was forced to deny rumours he had died in Spain. Dos Santos’ long rule has seen the end of Angola’s bloody civil war that lasted from 1975 to 2002, and he has presided over a post-war investment boom as the country exploited its oil reserves. But the flood of money brought little benefit to Angola’s poor, and the crash in oil prices in 2014 triggered a full-scale economic crisis. Opposition parties, who have a low profile due to restrictions on their activities and lack of finance, have sought to tap into public anger at the government. 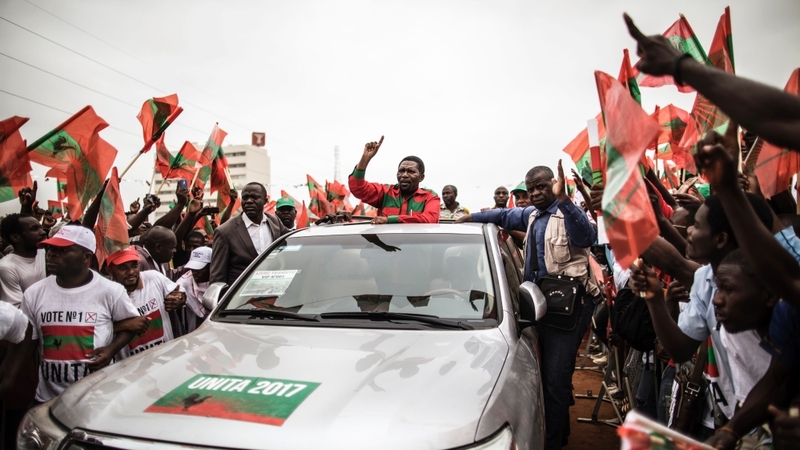 “You who are suffering, you who are in poverty, without electricity, without jobs or nothing to eat – change is now,” Isaias Samakuva, candidate for the main opposition UNITA party told supporters on the campaign trail. Samakuva, 71, took over UNITA after longtime rebel leader Jonas Savimbi was killed in 2002, a death that marked the beginning of the end of a 27-year civil war. Lourenco, 63, has focused in his campaign speeches on vowing to “fight against corruption”, “create jobs” and “make Angola better”.